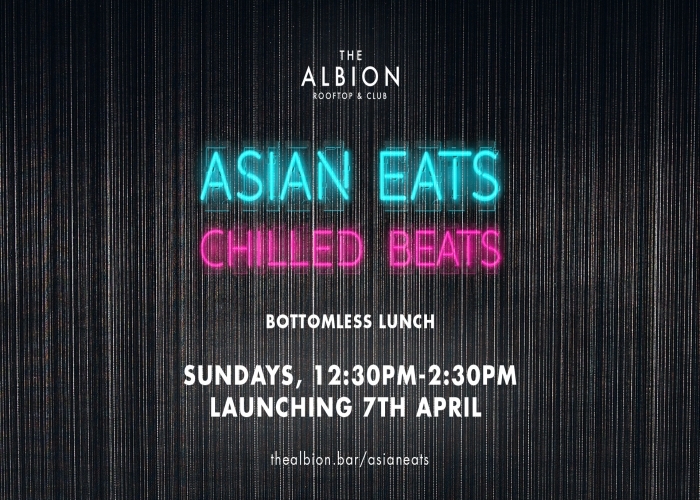 Our Asian-inspired bottomless lunch is the perfect way to kick-start your Sunday session this Autumn on Melbourne's hottest rooftop bar. For $50pp you'll enjoy one generous plate from our Asian-inspired menu along with bottomless bubbles, mimosas and beers PLUS your choice of Asian cocktail or the ever-faithful Espresso Martini. Our DJ will be playing chilled house from 12.30 followed by live acoustic & DJs 'til late. The Albion Rooftop won Best Rooftop Experience in Victoria in the 2018 Australian Hotels Association. Fully heated and geared to shut our the rain or let in the sun; you can be sure to enjoy your day and great city views in comfort, whatever the weather. For $50 you'll enjoy light Asian-inspired share plates (one plate per person) with bottomless bubbles, mimosas and beers PLUS your choice of Singaporean cocktail or Espresso Martini on arrival. *Please note that this event starts at 12.30pm... bottomless drinks ends at 2.30pm, so make sure you arrive early to take advantage of the full two hours!